YES!!! Now I can finally get at least 1 Royal Guard (but likely 2+)! Thank you, thank you Hasbro! Stoked! Neat! I hope these make it to the UK. At the moment in our Asda stores (Part of the Walmart group)it's still pretty much just wave 1 right now, even though wave 2 did briefly show up a couple of months back before most collectors swiped the figures up. 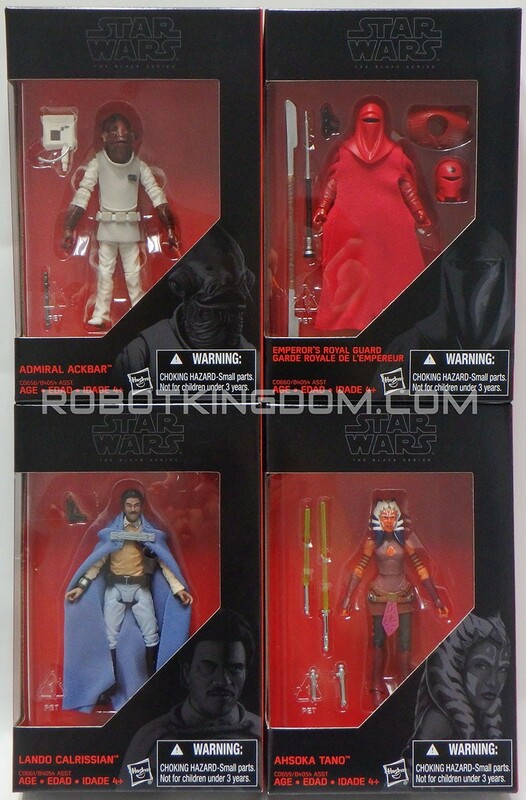 If I get lucky this year, I'll be getting an Ashoka and 4 Royal Guards. Yeah I'm not holding my breath that I'll ever see these in stores. The Walmart here hasn't gotten anything past the Ren/Rey/Finn figures. Same. But so far I've found most of the one's I need in Walmart's road so I'm confident that I'll find something in the wild. Why do they keep making them Walmart exclusives!? And based from testimonials here, Walmart doesn't care if they actually sell and/or stock them anyway? Walmart signed a deal to be the exclusive carrier of the 3.75" Black Series. It was either that or no more 3.75" Black Series as there had been nothing new announced for a long while before that deal was announced. I probably will. So far though other than the deleted scenes ROTJ Luke there haven't really been any Black Series figures I can recall that I just have to have. But if I keep seeing that First Order Stormtropper I'll probably get it eventually. And I wouldn't mind that Ashoka either. Never did see the Vintage Collection version. I've been kicking myself for years for not ordering that TVC Ahsoka from Amazon before she sold out. She's been one of the most disappointing absences from my 3 3/4" collection, but with the luck I've had with the Wal-Mart 3 3/4" Black Series figures in my area, hopefully she'll finally be in my collection fairly soon. Already have that Lando and Ackbar, but I'll take an Asohka and three (two for the Emperor and one in the alternate gear) Royal Guards. Of course, that's if it ever shows up in the UK. Still waiting on Force Awakens figures to be available! To be honest, I'm not too bothered with repacks as long as they're good. None of that Vader with swivel elbows nonsense. Just as long as the make figures for the new movies too, I'm okay with previous films just getting repacks for a while. Yes!! Finally an Emperors Royal Guard 3.75" that won't cost upwards of $200! Yeah I'll definitely be getting a few as well. The cape on Lando looks nice. I really miss the Vintage series, it was such an awesome line, superior articulation, incredible paint apps and awesome accessories. I don't mind at all to get a few repacks so we can get a second chance at some of the Vintage figs missed out on the first time around. I'm not a 3.75 collector outside of the few things I try and grab *everything* of, but the Royal Guard might fall into that category. Doubt the 6 inch will come with the awesome accessories.